The French football giant commissioned us to design a poster for their match versus Bayern Munich. 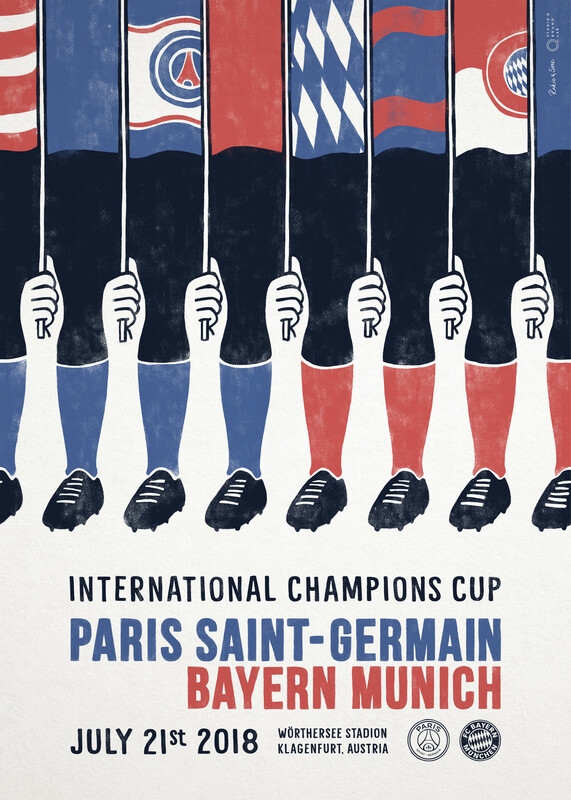 The famous French football club Paris Saint-Germain commissioned us to create and design a poster for their exhibition match versus Bayern Munich as part of the International Champions Cup, taking place in Klagenfurt, Austria. „We have a tradition to collaborate with different designers on posters for our big games,” said Maxime Agostini, PSG’s Deputy Brand Director. The club wanted an atmospheric, artistic poster that could do without the big stars of the club. Studio Q Brand Lab was chosen because of the design quality of their posters for European films. The illustration of hands holding flags and both teams’ players’ feet standing together sharply in line growing against each other as positive and negative forms are building an optical illusion that is visually shaping the story together with the unique hand-lettered version of the Bebas typeface. Teamwork is a family matter: Iva Rakic-Svec and Michael Svec together with Prof. Ivica Rakic. 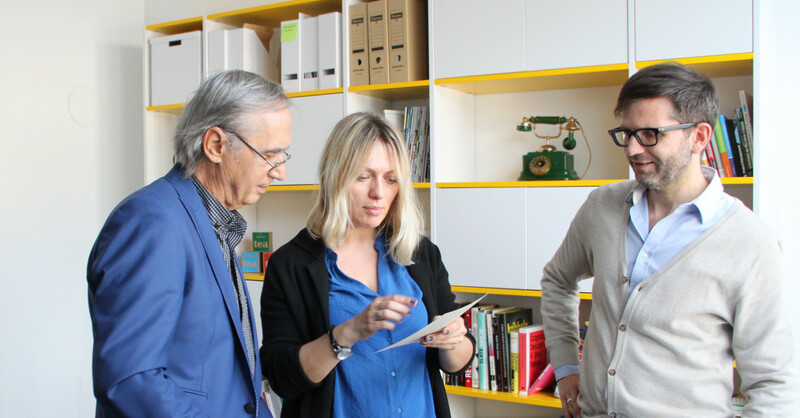 Studio Q Brand Lab is an award-winning design agency with offices in Vienna and Belgrade that is run by the passionate designer couple Michael Svec and Iva Rakic-Svec. As usual, they worked on this project together with the rest of their team and family, young graphic designer Nikola Rakic and Prof. Ivica Rakic, whose decades of experience as a professor of graphic design make him an irreplaceable consultant for the team. Together they came up with ideas, did several rounds of sketches and chose the best one to be polished by Nikola’s illustrative skills while Iva was working on the custom-lettered typography. Learn how our formulas for brand awesomeness can help your brand to find its place in people's minds and hearts. Sign up today and stay tuned with all our latest news & information! We take your privacy very seriously and hate spam as much as you!